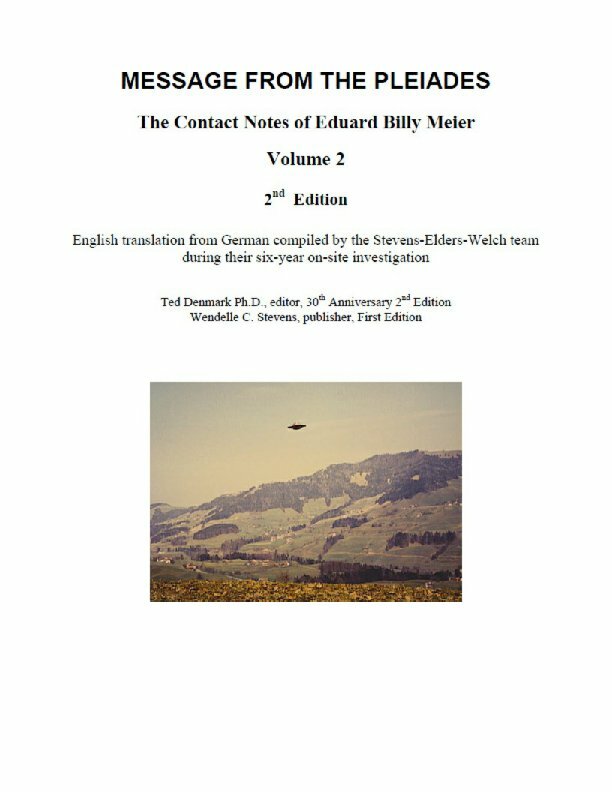 This is the second volume of the Contact Notes of Swiss farmer Eduard "Billy" Meier in a newly edited 30th anniversary 2nd edition, completely revisioned and rewritten by editor Ted Denmark with numerous color photos of the ET Pleiadian "beamships" taken by Meier in place of the black and white plates in the original first edition print book. This is the first re-publication in English of the original classic Swiss-German contact reports, out of print for more than 30 years with expanded introduction, appendices and notes. 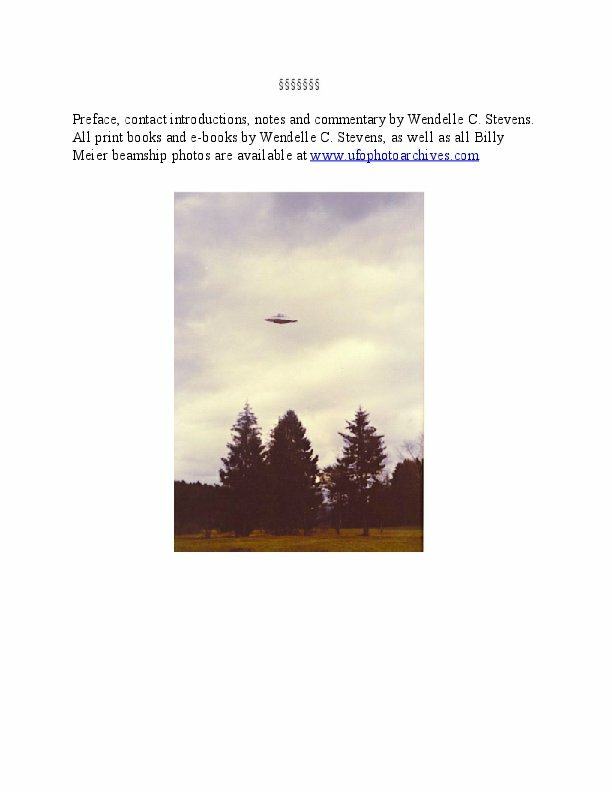 This 2nd edition of the underground classic dedicated to the memory of Wendelle Stevens, is still likely the most important and revealing contactee document ever released for publication. Editor Denmark was able to purchase copies of the original thousand print-book run and was greatly moved upon first reading them but also very frustrated by the raw and uneven nature of the translation, particularly of Volume 2, and upon later release of the original "transliteration" by Wendelle Stevens, set himself the task of producing a 2nd far more readable and comprehensible edition of the four volume set. Volume 2 does not restore all the censored elements (which Wendelle said were misplaced or stolen) as does the amazing Volume 1, but does provide a far more readable text in idiomatic American English as well as many amenities in addition to the color pictures, including additional notes and a summary of all the contacts in a new appendix. This second volume is nonetheless a stunning and compelling continuation of the narrative begun in Volume 1. 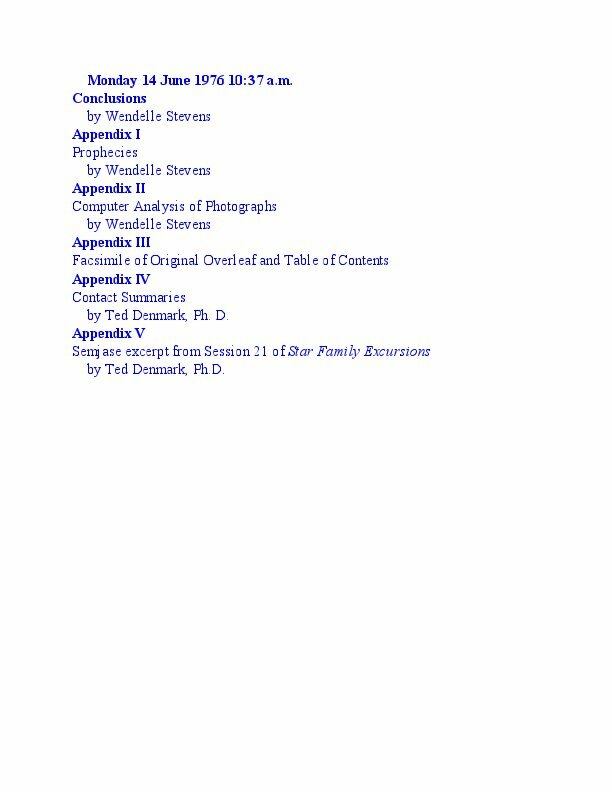 Editor Denmark lived in Zurich, Switzerland just before the Meier contacts began in 1975 and had enough German or Swiss-German dialect language facility to attempt the re-editing/ revisioning effort, even though he does not claim it's as fully accurate or authoritative as the authorized Meier translations, also done in later years, but as an additional unexpected revelation (!) he, as a "late-bloomer" and perhaps minor contactee of the Pleiadians himself, also reports contact with Semjase nearly three decades after first reading the Message books, through visionary "seer" Julie Loar, among many other things, which they have investigated and written about together at length in the five-volume *Five Star Series* of their own experiences with "The Pleaidians" in addition to many other ETs. 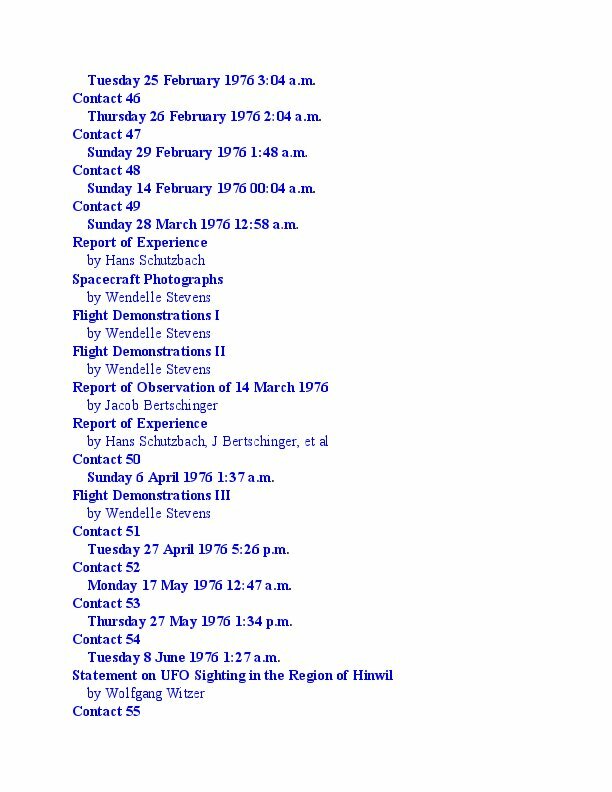 His own later contact experiences also involved a close encounter with a Pleiadian beamship as recounted in his own recently published "contactee Memoir" Winged Messengers (2017). 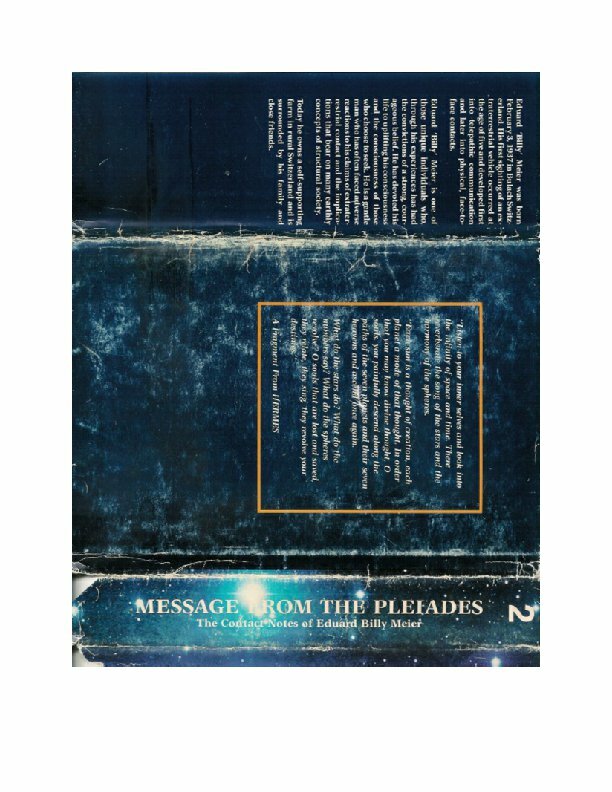 If you have read Message from the Pleiades V. 1, you will not want to miss the remaining volumes in the series, if only to finally arrive at Volume 4, from which like a bookend to Volume 1, provides the concluding series of Billy's collaborations with the incomparable star-woman Semjase and her tragic freak accident while at the compound of the Meier group. Altogether, it's an unforgettable epic that will eventually be seen as a cultural treasure and a milestone or pivot towards the New Age, for which Billy had originally been selected by the Pleiadians under their tutelage as its Earthuman Prophet (! ), which out of medesty, he was always reluctant to acknowledge. 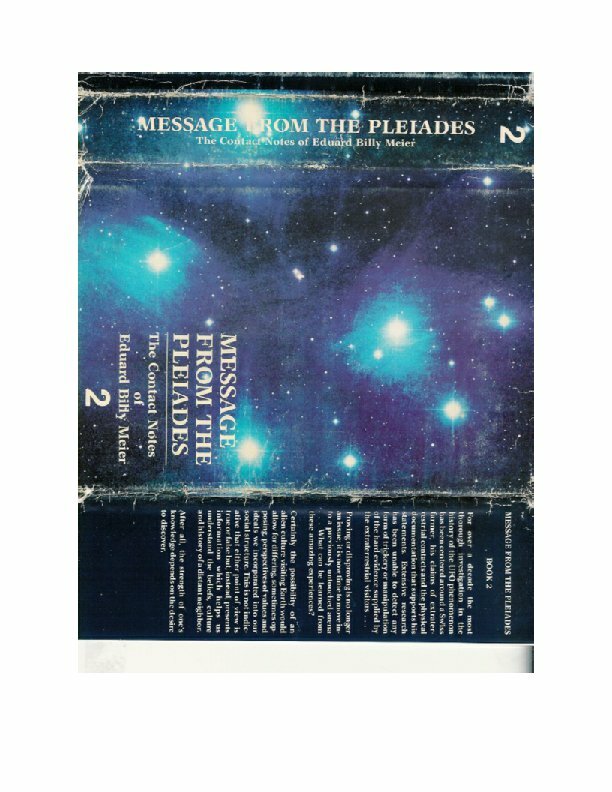 Message from the Pleiades, Volume 2, 2nd ed. 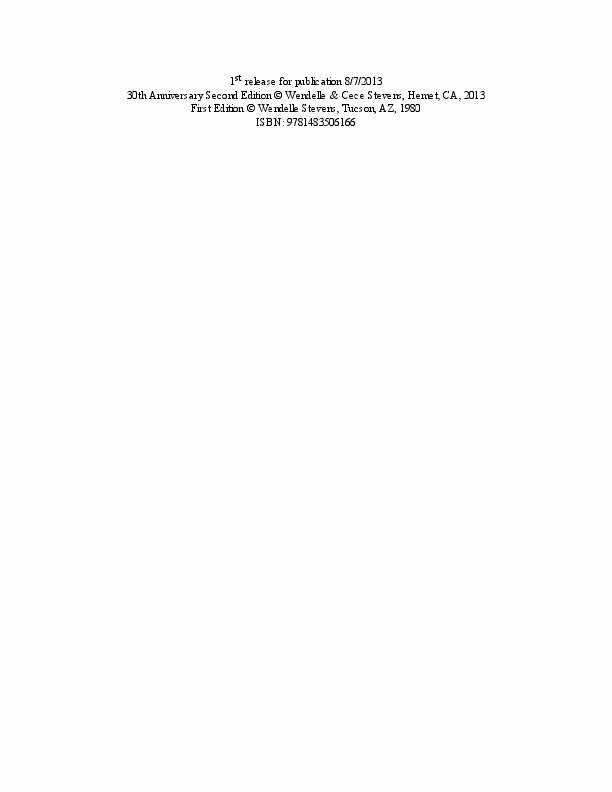 Ted Denmark, Ph.D., editor, copyright Wendelle Stevens and Cece Stevens, Hemet, CA, 2013-2017 (original limited edition print book publication with copyright by Wendelle Stevens, Tucson, AZ, 1990). 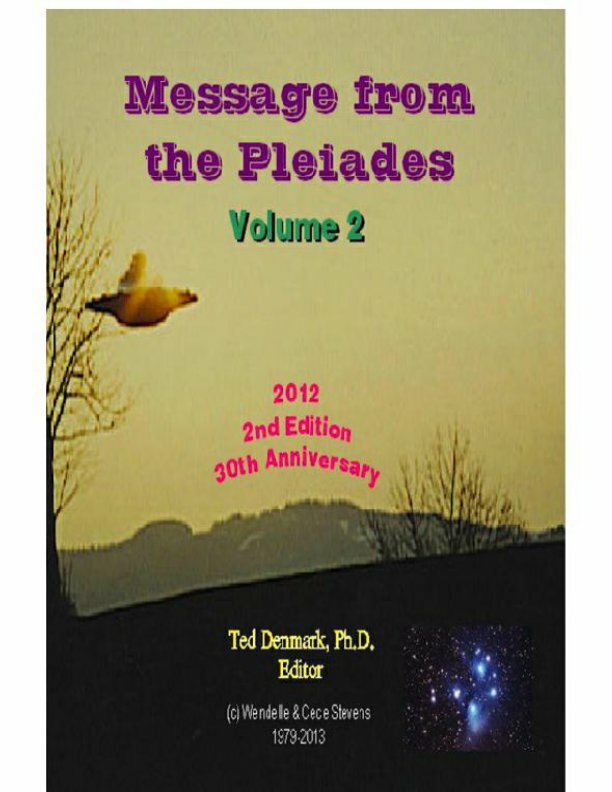 Wendelle Stevens’ presentation of Message from the Pleiades, Volume 2 begins with Contact 36 and continues through Contact 55, fewer in number than those included in Message V. 1 but now more uniform in length, as things settle down into a more established routine after Meier’s mind-blowing “great voyage” to the edge of the universe—which effect was undoubtedly intended by the Pleiadian ET’s to help him get motivated to make a more unswerving commitment to their common mission. 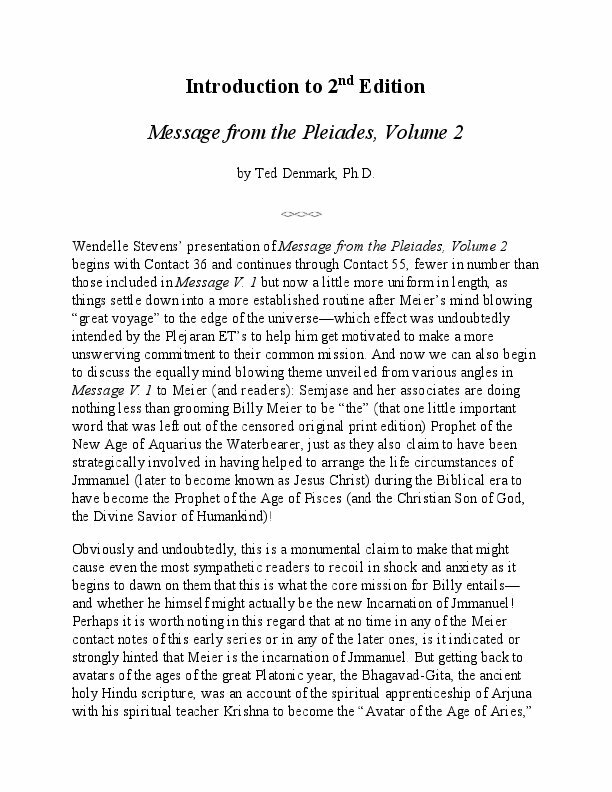 And now we can also begin to discuss the equally mind-blowing theme unveiled from various angles in Message V. 1 to Meier (and readers): Semjase and her associates are doing nothing less than grooming Billy Meier to be “the” (that one little important word that was left out of the censored original print edition) Prophet of the New Age of Aquarius the Water Bearer (!). Billy’s natural response in the face of the challenge of this amazing heroic venture presented to him by them is partially—and sometimes primarily—one of reluctance, even though he also believes, knows and accepts that he is the authentic individual required for this ritual enactment as Prophet of the New Age (at one time Billy stayed at an ashram in India and is obviously a very advanced student of esoteric studies). 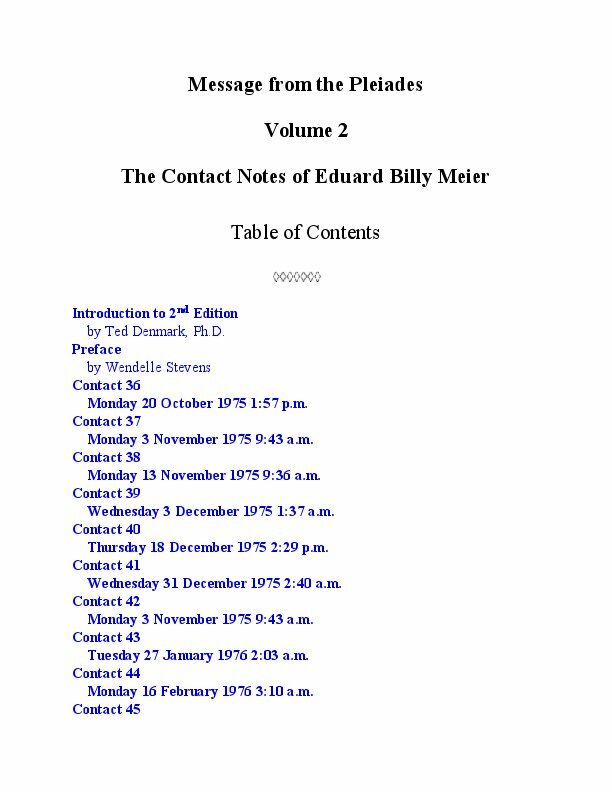 Billy Meier had taken his nickname from the American cowboy legend “Billy the Kid,” perhaps oddly enough for a Swiss native who came to hold a fairly negative attitude about the government (and others) in the USA in our contemporary times of Centuries 20 & 21. But Billy is also extremely … modest in a self-effacing way about his own possible aspirations, always challenging Semjase whenever she attempts to encourage him with any kind of praise. Billy has also confirmed himself as an “anti-materialist” so that he must always give extreme priority to his spiritual aspirations, and never be contaminated by merely physical or economic motives, which his ET “handlers” admire but find … much too unreasonable and unrealistic. The Pleiadians make correspondingly extreme efforts to deflect his defensive reluctance, modesty and anti-materialism that go with his oddly extreme (a contemporary word we can liberally apply to Meier and this whole saga—indeed to the Aquarius Archetype itself) and unusual set of mannerisms in the unlikely life story of an archetypal “outsider,” indeed perhaps the most extreme one ever to have his story recounted. If the culmination of Message V. 1 was the “Great Voyage” to the edge of our Universe, then the most spectacular event of Message V. 2 comes early with the beamship trip in Contact 39 through the dimensional doorway in the Bermuda Triangle and thence on to visit the two parallel universe “Earths” that somehow co-exist with our familiar physical Earth in this dimension, one a primitive ancient Earth on which dinosaurs (“saurians”) roam and the other a somehow “real” future Earth enveloped in a mysterious white vapor. The actual current physical Earth then becomes like the dynamic middle “key frame” in a reality animation that had a fixed beginning and multiple probable endings—with a moving middle that changes in accordance with the free will perturbations of all conscious actor/ creatures in the multidimensional space/time tapestry they create by interacting together. All of this terrain is quite well known to Semjase, still his main host, and the Pleiadians, who once again attempt to reveal to Billy what the nature of the Universe is really like for a being of expanded dimensional awareness, which he needs to more consciously become as the apprentice New Age Prophet who will need to offer his own spiritual teachings to fellow Earthumans later in his Incarnation. The tension between Billy, his wife and the increasingly restive followers in the group, remains in various ways, mostly because the members of the group still can’t believe they are being asked to sacrifice their own ambitions and support Billy as their leader without having any close personal verification contacts themselves with the ETs—or even to see them one time. Semjase is sympathetic with their dilemma but remains under strict orders from her own High Council that direct contact be exclusively restricted to Billy himself, which will continue to cause trouble throughout. The relationship between Billy and Semjase, though still seen by him as a somewhat remote superhuman “goddess,” is also yet a beautiful … single woman in her prime of life, remaining as a continual temptation and trial for him, which remains one abiding motif of this great Archetypal New Age Love Story—for it is no less than that—even if it is also much more. It is the sign Aquarius that now offers the possibility of restraining that emotionality in the name of ethical rationality for the New Age of Aquarius as spirituality moves from the former, darker self-effacing and self-destructive tendencies of Pisces into the emerging new era, combining scientific rigor and spiritual attitudes in a veritable “science of spirit,” culminating in a universal brotherhood for all humankind, both terrestrial and extraterrestrial. Semjase and Billy then are engaged in becoming the dramatis personae who are the archetypal individual representatives of this millennial transition. Semjase and Billy have both already come to realize in various ways from their adventures together in Message V. 1 that they do love each other in quite powerful ways, but Semjase as the senior partner in the relationship (always with the odd twist that she is actually much older than him yet looks to him much younger than himself, hence his frequent reference to her as “girl”), must maintain the protocol of “dear loving friends” rather than a more “normal” emotionally involved relationship as lovers with physical aspirations, which is not always so easy, even for two “naturally” emotionally restrained Aquarians like themselves. Semjase’s father Ptaah, though not physically present for most contacts, is always the virtual sympathetic chaperon, perhaps being able to telepathically monitor current circumstances if tempted, even as a Jshwsh (“God” or “King of Wisdom”) like himself must do, to try to better understand the enigmatic Billy, for whose welfare he is also responsible as the chief Pleiadian commander in our solar system. When we get to the last contact of Message, V. 2, Contact 55, there is no major development, no natural ending or thematic shifting of narrative, only a bridge to more extensive developments coming in V. 3. Billy is always loaded with questions, often from members of his group of followers, which Semjase always tries to answer as her busy schedule of responsibilities allows. Those questions and answers are also for us, the readers coming along more than thirty years later, to follow the thread of the teaching being given—because Billy wants it to be clear he didn’t make all this up himself. The source is ET knowledge, which he often appears to have already anticipated. Billy is finally left with an impressive and, as far as I know, original teaching about how the primary natural evolution of life on Earth has been driven over the aeonic millennia. Ted Denmark, currently residing in the California Motherlode, has lived in Northern California for most of the last 50 years. He attended Rice University for B.A. (philosophy), studied Jungian psychology in Zurich Switzerland and attended graduate school at UC Berkeley where he received his Ph.D. in Developmental Psychology in 1975. He worked at UCB Space Sciences Lab as a design engineer for several decades before becoming a computer software engineer at Autodesk. He later was an adjunct instructor at Columbia College in Columbia, CA, teaching computer science and specializing in design graphics. His interests include organic gardening, solar architecture, astrology, ballroom dancing and a wide array of scientific and esoteric studies. His current retirement career as a writer has been primarily focused on exploring and writing about his and other contactee experiences over the course of his lifetime. The Star Table Trance Missions by Ted Denmark, Ph.D.